Tomorrow is D Day, the start of a new school year and the beginning of the back to school chaos. These holidays seem to have flown by and I’ve enjoyed them more than I had imagined I would! The house is reasonably in order for a change and I’m ready for the kids to get back into some routine. Here is my basic daily routine for back to school. To give you some context for our routines I thought I should share a bit about our family and home. Obviously every family and home is different so depending on your family dynamics, ages and home set up work out what routine works best for you. Trying to get three kids looking at the camera AND smiling at the same time is basically impossible. Me: Up until very recently I’ve been at home full time with the kids while running my business from home. I have recently started working again part time outside the home three days a fortnight (I’m a Clinical Audiologist by profession). Hubby: My husband works full time outside the home, he leaves the house well before anyone is up and gets home most nights right in time for the bath/books/bed routine. 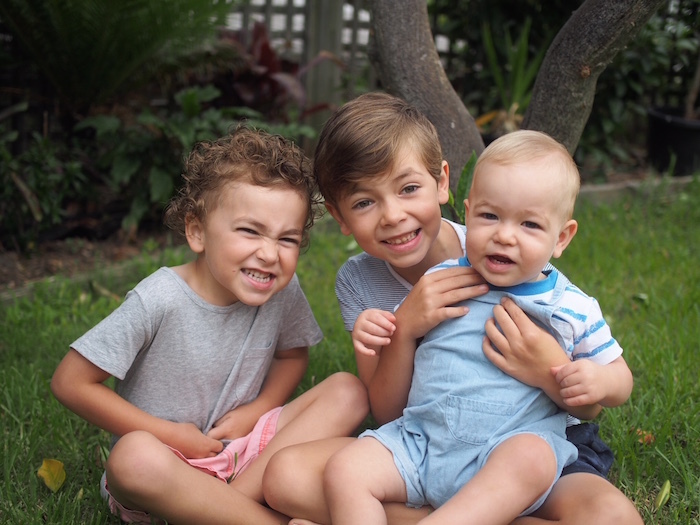 Our Boys: We have three little boys aged seven, four and one. Mr 1 is home full time, Mr 4 is in preschool two days a week and Mr 7 is in Year 2 at school. Our Home: We moved almost 18 months ago and our home is small but functional. The big boys share a bedroom and the baby has his own small bedroom. My hubby and I have the other bedroom and we have another bedroom that is used as a playroom. We all share one small living/dining area and kitchen space. We have a good sized yard and outdoor patio. We are currently significantly lacking in storage but otherwise we are well set up for family life. We don’t have space for fancy bag organisation stations or anything like that (as much as I’d love it!) so our general rule is that toys live in the playroom and clothes/bags go in the bedrooms. So you’re probably wondering why I’m starting with the evening routine?! Well the truth is, the success of my morning routine comes down to my evening routine! Every evening I get the kids clothes out for the next day (they are now old enough to help with this) and I pack lunches. If I’m working I also get my clothes ready and pack my own lunch. Depending on who is still wrangling children, either my hubby or I pack the dishwasher and clean up the kitchen so it is ready for breakfast. We also generally hang out a load of washing. Although I know lots of people don’t like leaving washing out overnight, I’ve personally never had a problem. If I’m feeling extra organised (or know that I’ll have a rushed morning) I’ll lay out breakfast bowls, spools and cereal containers on the bench. I also make sure all bags are packed and ready by the door. The rule in our house on school mornings is that the kids can have free play and/or TV time only when EVERYTHING on their morning list is done. This motivates them to get through their list quickly as they know that if they dawdle, they miss out on play time. Often my eldest will get up before me so he will get his breakfast and get dressed (on a good morning!) on his own. Once I’m up it’s a quick shower, feed & dress the baby, help the 4-year-old get ready and remind the 7-year-old to keep moving! I try and chow down breakfast and a cup of tea before heading out the door too. How do you get things organised for school days? Do you like to prep the day before or do you prepare to get up early? Hi, I have 3 kids that are similar ages to your 3. I have started batch cooking muffins to eat on the school run (the “run fast, eat slow” muffins are great). 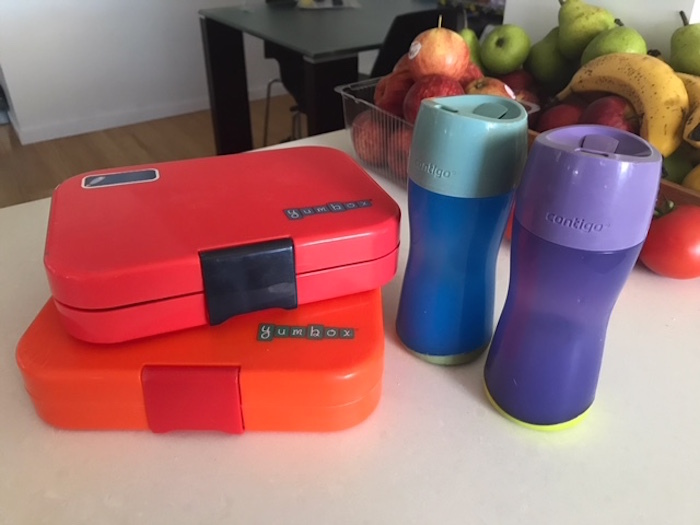 I also have a bodum insulated mug to use on the school run as well. This means that I can focus on getting out the door, knowing that I can eat in the car. This is really cool. Thanks for sharing this post. Thanks for the tips, I have 3 kids as well and work from home (kind of). Its home office and I work in sales. We do much of the preparation in the morning as I get up early. It all works much better if we prepare the night before but honestly I can’t be bothered (but it works better).